We reported here on September about our collaboration with Tania Hershman, author of the new book "The White Road and Other Stories", published by UK's renowned Salt Publishing. This great collection of short stories is balanced out by Hershman by planting a tree with Eco-Libris for every copy printed. Today we also have the pleasure to be part of her worldwide blog tour, organized by Salt Publishing. This is a great opportunity to learn more about the book and especially to get to know better the author behind it, so here we go. 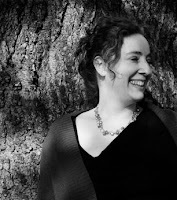 Tania Hershman was born in London in 1970 and in 1994 moved to Jerusalem, Israel, where she now lives with her partner. "The White Road and Other Stories" is her first book. Tania is a former science journalist and her award-winning short stories combine her two loves: fiction and science. Many of Tania’s stories, which have been broadcast on BBC Radio 4 and published in print and online, are inspired by articles from popular science magazines. In November 2007, she founded The Short Review, a unique website dedicated to reviewing short story collections. For more on Tania's current projects, visit TaniaHershman.com. Tania, congrats on your new book and welcome to Eco-Libris, which is your seventh stop on the virtual tour. How does it go so far? I know it's greener to go on a virtual tour but is it easier than going on an actual book tour? Well, considering that this virtual tour covers Europe, Africa, the Far East, Australia and New Zealand, I am far less jet-lagged than I would be and not so sick of airline food! But it is pretty exhausting, answering so many questions about me, my writing, my thoughts on science, religion, literature, more topics than I imagine I would have covered on a “real” book tour. I don't normally talk about myself so much and I am spending hours contemplating my answers, which is an interesting thing to do, but not too often. You are working with Eco-Libris to balance out the paper used for the book by planting trees. What brought you to go green with us? Well, as you know, I wrote an article about Eco-Libris when I still worked as a journalist, and at that time I was hoping that one day I might publish a book myself. I love what you are doing, your ethos, and the way you are doing it. So when the book deal came through and I started to realise the my dream would involve the felling of a large number of trees (provided people actually bought the book!) I thought of you. My partner and I try and lead as green a lifestyle as we can, we compost, we recycle, we shun plastic bags (a particular passion of mine), and so this made sense to me. As someone with a science background and a former science journalist, maybe you can help me figure this one out - how come we still make paper of trees? how come we found how to put a man on the moon but can't find another source for paper other than one of the most precious natural resources we got? That's a great question and one I feel totally unqualified to answer, being more of a failed science student than a scientist. You are right, of course. Why can't we? Why can't we come up with a green alternative, one that looks and feels like paper, but can be manufactured without cutting down trees, and doesn't involve electricity, batteries, spare parts, noxious chemicals? Sorry, can't help you there. Israel is a wonderful source of innovation and all the people I met when I was writing about science and technology here believed that they could solve any problem – so why don't you put it to some of them? How do you feel about e-books? do you think in 10-20 years they will rule the book market? do you plan to publish on electronic format? Personally, I have never read an e-book and I find the idea of reading on screen unappealing. I love books. I have been in love with books since I was a child. I just love to hold them, to turn the pages, that for me is an essential part of the reading experience. But I know that for the kids of today, things are different, screens are part of their bodies, extra limbs, so perhaps they are the natural e-book consumers. Although I am not afraid that that books will vanish – television didn't kill radio, so I remain hopeful. My publishers, Salt, don't publish e-books, so that is not an option right now, but I am open to anything. One eco-friendly option for book lovers is going to the public library. Do you do that? if so, how often? I loved libraries as a child in London, my weekly trip with my Dad, the hushed atmosphere, the miles of free books, so much to read, a seemingly endless supply. Here in Jerusalem, things are a little different. I don't read for pleasure in Hebrew. If you don't mind, let's get a little personal - how does a life of a writer looks like? can you share with us a regular day in your life? A regular day? Well, let me dispel some myths: I don't get up at 6am and write for four hours (friends of mine who are reading this will be laughing at that one). I don't have any goals such as writing 1000 words a day. I write short stories, some very very short stories, and that is completely different from working on a novel, a long-term project. Some of the stories of mine that I love best were written in 20 minutes. So for me the main thing is to clear room in my head to allow the creativity to come. My issue right now is finding the space to work in; my partner and I both work from home and I don't have a study with a door I can shut. A writer without a room of her own! We have plans to renovate our cellar, in an environmentally-friendly way, I hope, which would be an ideal solution, right by the house but not in the house, so I can be alone with the voices in my head. When that happens, perhaps I will have more of a routine, but right now I go and sit in local cafes with my laptop, I work well with that kind of white noise, but it is expensive, and I tend to eat too much and over-caffeinate! You were born in London and live now in Jerusalem. You mentioned in one of the interviews how you like the hectic life there. Do you see yourself living and writing anywhere else? Did I say hectic? Actually, after London, Jerusalem feels like a village to me, it's a manageable size, I can go places on foot, friends live in walking distance, I have my favourite cafes, the food here is fantastic. I love living here, but I know that anyone outside Israel imagines that it is how they see it on the news, and, as you yourself know, it isn't like that. We get on with the everyday, and life here is very spontaneous, which I like. In London you have to make plans months in advance. I don't know what I will feel like doing tonight, let alone in 3 months. So, no, I don't see myself living anywhere else, but I am open to fellowships and writing residences. I spent several weeks in France in November at a place that called itself a “writing retreat” but didn't live up to its name and ended up being more stressful than peaceful and creative. Next year I hope to be going back to the heavenly Anam Cara retreat (http://anamcararetreat.com/) in Ireland where I can get a great deal done in just a week. So, yes, I love living here but I also like to leave every now and then, a change of scene is good stimulation for the senses. I should also mention that I have never written a story set in Jerusalem. That's just not what comes out. Perhaps you can't write about where you are. My stories are set in the UK, the US, Antarctica, and even in space – I don't feel too constrained by reality when I write! I believe that short stories became very popular in Israel in the last 10-15 years. Are there any Israeli short story writers that influenced your writing? I don't know about the popularity of short stories in Israel, but I have to say – unsurprisingly – that I am a huge fan of Etgar Keret's stories. They are wonderfully surreal, touching, moving, shocking. He is a huge inspiration to me. I haven't read them in Hebrew, though, much to my embarrassment. Your book is written in English. Is there a special reason you chose to write in English and not in Hebrew? Do you see yourself publishing in the future in Hebrew? My written Hebrew is about the same as a five-year-old's! Good enough reason?? I speak and understand Hebrew fluently but never had to write in Hebrew, as a journalist I reported for American and British journals. So no, I highly doubt I will pull a Samuel Beckett and write in a language that isn't my mother tongue. I love the English language, and am thankful that even after 15 years in Israel I haven't lost my language skills. I sometimes think that being bilingual allows me to be more flexible and playful with English, I don't know if there are other bilingual writers who feel like that. You have a very impressive online presence with a blog that you write for almost every day - how do you find blogging? is it easier to blog than to write "regular" stories? do you find it enjoyable as well? Blogging has become a lifeline for me, it sustains me in so many ways. Writing my blog - which focuses mostly on the writing life - and reading fellow writer/bloggers' blogs brings me community, a community I haven't found here in Israel, of English-speaking fiction writers. This community is warm, generous, open, supportive, interested, candid about the difficulties of writing, celebrating one another's achivievements and commiserating the rejections. Blogging has become a very important part of my life, is a completely different type of process from writing short stories, but some of the aims are the same: I blog to connect with like-minded folk anywhere. I also blog to find out what I think: often, it isn't until my fingers are moving across the keyboard that I discover how I feel. This is also true of short story-writing for me, things come out that I had no idea were in me, and when someone reads a story of mine and tells me it touched them, there is no better feeling. Do you think that a blog/website is something that every author needs nowadays in both marketing terms and interaction with readers? As a writer who is trying as hard as possible to market her first book, the blogsphere, Facebook, my websites are indispensable tools. I don't know what I would do without the Internet, I don't know how I would go about telling people about my book. I would have to do a book tour, I would have to be on the road, which, apart from anything else, would increase my carbon footprint, as well as taking so much time away from my writing. The Internet has also, I think, opened up such a wealth of opportunities for short story writers, especially for those of us who write very very short stories or flash fiction. Submitting your stories electronically makes it easier to send them out, and being published online, while not the same as seeing your name on the printed page, means you can link to your work and perhaps find more readers, worldwide. There are new online literary magazines starting up on a daily basis, which is thrilling. Anyone who thinks the short story is floundering should have a quick look at what is going on online, they would be amazed. And some of it even pays! What's going to be your next book about? is there any chance we'll see soon a collection of yours of short stories about global warming? It's been done! On the website I founded to review short story collections, The Short Review (www.theshortreview.com), we reviewed Guy Dauncey's collection, Earth Future: Stories from a Sustainable World (http://www.theshortreview.com/reviews/GuyDaunceyEarthFuture.htm). Right now I am not in a hurry to publish a second book, I am focusing on marketing this collection, as well as getting back to my writing, much of which is flash fiction. I was recently shortlisted in a six-minute play competition with a play I adapted from one of the stories in my book. My play will be performed in London next year, so this is one new direction I am pursuing. I also have an idea for a film script – no environmental themes, though, I'm afraid. Thank you so much for having me and for what you are doing for my book and for the planet! Tania Hersman is giving away one copy of her new book!! This is a great prize, which includes a tree planted for this copy with Eco-Libris. How do you get a chance to win this prize? just add a comment below with an answer for the following question: what do you prefer - short stories or flash fiction, and what's the best length for a short story? feel free to mention your favorites! Submissions are accepted until next Tuesday, December 16, 12PM EST. Tania will pick the comment she liked best and the winner will be announced on our blog the following day. Next stop on the Walking the White Road Virtual Book Tour will be at Kelly Spitzer's blog on December 16th, 2008 for a slightly different type of “interview”. I prefer short stories over flash fiction, as there is that little extra space to expand the atmosphere of the story. My favourite writers in this genre are Marget Atwood & John McGahern - ranging from Canada to Eire, with a sense of the science fiction-ish and the parochial. I prefer short stories --- 30 - 35 pages. I love short stories. everything is so hectic especially with the holidays, you dont feel as guilty when you have to put a book down and don't get back to it for a few days. after all you already finished one story and are on to the next! i just finished Mr Jefferson's Piano It was amazing! I highly recommend! I like short stories as well. Then I can read it and put it down. Thanks! I orefer short stories I am reading books on Angels by Doreen Virtue, PHD.. I have been a lover of the short story since I read Shirley Jackson's The Lottery. I love short stories. The really good ones always leave me wanting more. I'm an avid reader and sometimes a short story is just better and more convenient than a longer book.